The 2019 Ford F-150 is an exceptional vehicle, offering great performance and power, especially in terms of its engine power! The new Ford F-150 delivers exceptional features, bringing a level of innovation and toughness to the table that is guaranteed to please any driver on the road today! These features include things like engine systems, performance features, and more! Continue reading to learn more about what this vehicle has to offer! As mentioned above, the 2019 Ford F-150 is a truck that offers exceptional performance and power! It has a list of amazing engines and systems for you to enjoy, especially in terms of power! Some of these engines include V6 models and V8 models, such as an Enhanced 5.0-liter Ti-VCT V8 engine, which delivers 395 horsepower and 400 lb-ft of torque, as well as a second generation 3.5-liter EcoBoost® engine, which delivers up to 375 horsepower and 470 lb-ft of torque in total. These engines are paired with a 10-speed transmission, a SelectShift® automatic transmission that delivers amazing power and acceleration for all to enjoy! The 2019 Ford F-150 doesn’t just have power and performance, it also has many great interior features and systems! These include things like heated and ventilated front seats, giving you comfort no matter where your drive takes you, or what the weather hurls at you! If you’re looking for a vehicle that delivers amazing infotainment, look no further than the 2019 Ford F-150! This vehicle features a SYNC® 3 system, which gives you amazing entertainment infotainment no matter where you might find yourself! The 2019 Ford F-150 also features many great interior technologies, like a rear-view camera system, which allows you to see what’s behind you without worry! This gives more security as you drive! 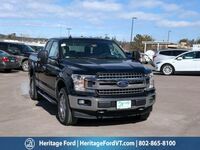 So, if you’re looking for a vehicle that offers amazing power and performance, as well as exceptional technologies and infotainment, look no further than the 2019 Ford F-150! 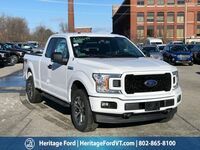 Contact us at Heritage Ford to learn more about this great vehicle!